Learning conflicting lessons from Rabin's life. Yitzhak Rabin embodied the contradictions of his nation. He was first and foremost a military man, leading the Israel Defense Force to victory in the Six Day War. But he was an agitator for peace, as well. 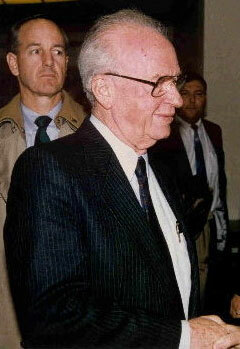 As Prime Minister, Rabin initiated negotiations with the Palestinians–famously shaking hands with his enemy, Yasser Arafat. In the story of the State of Israel, Rabin’s centrality is indisputable. His legacy, on the other hand, is fiercely disputed. Rabin’s assassination transformed him into a mythical figure, a symbol of a panoply of different–sometimes divergent–ideologies. What is Yitzhak Rabin’s legacy? There’s no one answer. Here are a few. Above all, Yitzhak Rabin was a hero of the great Israeli adventure. From the War of Independence to the Six Day War, he earned the respect of all, friends and enemies alike. He epitomized a generation that made the desert bloom, created a vibrant democracy, and accomplishing the dream of a millennium: The creation of a homeland to the Jewish people that would give refuge to Jewish victims of persecution throughout the world. Rabin bequeathed to us a model of politics at its best. Politics whose essence is serving the public, serving the state, service that will influence coming generations. Rabin’s legacy to the state in those years was courage, respect, and equality…. Rabin the man will not return, but his legacy will stay with us as long as there are citizens in the State of Israel who fight for it. The murder took us back but it cannot stop the wheels of history. From the distance of time and perspective, Yitzhak Rabin’s Oslo Agreement brought on a process of disillusionment by the Israeli public and the formation of a more realistic, sober and balanced perception of the moves Israel has to make…The Oslo agreement had its weaknesses but it was also justified. There is no doubt that it forced Israeli society to self examination that led to the conclusion that Israel must return to its correct borders and that it should be a Jewish and democratic state. In death, there are those who want to repaint Rabin as the white dove of Israeli history and I say this does not do him justice…I loved Rabin. He was no vegetarian. He could be brutal, but he was extremely honest and we must never forget he led the (Israeli army) to its greatest victory in 1967. The truth is he was not Mr. Democracy or Mr. Peace, he was Mr. Security. And this is what he will always be, no matter how the left tries to hijack his legacy. The legacy Rabin left is not simple. His life as soldier and peacemaker underlined the Sisyphean struggle to keep Israel strong and, when possible, to cut peace deals with its neighbors. His death highlighted the need for greater tolerance in Israel’s politically divided society…A decade after the assassination, it’s not clear how much of Rabin’s legacy has been implemented. Though left-wing politicians such as Yossi Beilin, who sponsored the “Geneva Accord” peace initiative, try to present themselves as the successors to Rabin’s legacy, a recent poll in the Yediot Aharonot newspaper shows that 24 percent of Israelis see Sharon–the Likud Party leader who vehemently opposed Oslo during Rabin’s lifetime–as Rabin’s true heir. It seems that Israel will flounder around for many more years in the twilight zone between “legacy,” which is the real thing a person leaves behind, and “legend” which emerges from symbols and symbolism. In the meantime, rather than “Rabin’s legacy” being formulated, the Rabin myth is being built up while using the word, legacy. A myth indeed requires tragic heroes, but a society that claims to be rational does not like to use the word “myth.” Legacy sounds much more dignified. But did Oslo “fail”? Obviously in the straightforward sense it did. We’re 10 years on from Rabin’s assassination–twice the trust-building period proposed–and the peace process appears not much further forward. But is that true? No one much now denies the obvious truth that the Palestinians must have a place of their own. That was almost unsayable in Jewish circles little more than a decade ago. Interchange with Palestinian leadership is now commonplace. We apparently rely on Egypt to provide us with lulavim [palm branches for the holiday of Sukkot] without embarrassment and we expect Jordan to help out. When the Iranian president urged wiping Israel off the map, the Palestinian leadership dissociated themselves, claiming all they wanted was to add Palestine, not remove Israel. The truth is that Rabin’s legacy is very complex, and simplistic slogans do not reflect the work and contributions of over 50 years of public life. No one can speak for him, or claim to know what he would have said or done under any specific circumstances. The members of his family, and the people with whom he worked most clearly have a special role in preserving his memory, but in terms of policies and perceptions, particularly in the security realm, the Rabin legacy is open to many interpretations. Longtime leader of Israel's Labor Party.